Its that time of year again! The Kentucky Derby is just around the corner and pre -Derby festivities area already in full swing. 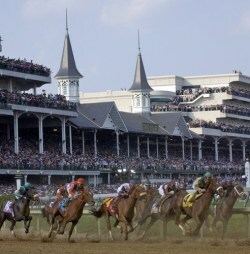 The 139th Kentucky Derby will take place at Churchill Downs in Louisville Kentucky Saturday May 4th 2013. Each year on the first Saturday in May, approximately 20 throughbreds continue the tradition and compete in the one and a quarter mile race. Parties take place all around town as well as in various cities across the U.S. If you're new to the Louisville area, you'll notice that Derby Day is treated much like a standard holiday here and receives just as much anticipation. Numerous businesses close early and mint juleps and stunning hats abound. Visitors descend on the town and some local residents even rent their homes out for the event. Its truly an exciting way to celebrate spring! Tickets to Derby range from $40 for general admission which allows standing room only viewing from the infield to multiple thousand dollar seating high above the track (some seats reserved years in advance). 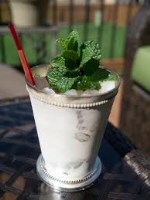 Neighborhood parties and family gatherings are often just as enjoyable as experiencing the Derby in person. Gather with family and friends for a party to enjoy the sunny spring breezes complete with derby attire, snacks, and games. Have a Happy Derby Day! For more information about things to do in Louisville, KY or updates on the Louisville Real Estate Market, contact At Home In Louisville Real Estate Group. 4108 Woodstone Way Louisville KY 40241 is a magnificent estate home in the established Woodstone Subdivision. A circular drive with stone apron greets guests. The front entry opens to a stunning Foyer with a grand stairway to the second level. Sparkling hardwood flooring flows throughout the entire first floor. The Parlor/Living Room showcases a beautiful wine cellar, chandelier, and custom woodwork. The Family Room is impressive with a two way fireplace that connects to the Executive Library, coffered ceiling, and multiple french doors which exit to the spectacular back deck. The spacious Formal Dining Room is positioned off of the kitchen featuring a columned entrance. The exquisite gourmet kitchen displays granite counter tops, top of the line appliances, maple cabinets, and a window seat. The Great Room is huge and a dramatic wall of windows provides gorgeous views of the property. A simple push of a button lowers a movie screen, turning the Great Room into a fantastic home theatre space. Stairs connect the Great Room to a lovely Sitting Room off of the Master Suite. A large first floor Bedroom and private Full Bath is currently used as a Guest Suite and would also make a great inlaw suite or nanny suite! A nice half bath completes the first level. 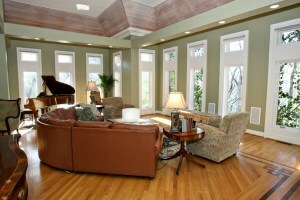 The Master Suite is incredible containing custom trim, a vaulted ceiling, sitting room, and a huge custom dream closet! The luxurious Master Bath is the perfect place to unwind with a whirlpool tub, separate shower, and dual vanities. The second level also houses three other spacious bedrooms (two connected by a Jack & Jill bath and one with its own private bath). The walk out Basement is completely finished and includes a work out room, office, music room, laundry, and additional Bedroom with Full Bath. There is also a Family Room with a bar and a brick fireplace. The back of the home feels like a resort with an amazing outdoor living space complete with inground pool, hot tub, and extensive deck area with tiered landscaped yard beyond! The property backs up to acres of wooded land providing an absolutely pristine setting. 4108 Woodstone Way Louisville KY 40241 has been extensively remodeled by a local architect with attention paid to every detail. The home is truly breathtaking and offers the best of both worlds- an outstanding quality of living and the perfect location. Call our qualified team of realtors today to set up your private showing. Our agents will be pleased to assist you with information regarding the Louisville Real Estate market and Luxury Homes In Louisville. This Sunday 8437 Arbor Meadow Way will be Open from 2:00-4:00pm! This fantastic stand alone patio home is move in ready with 2 Bedrooms and 3 Baths! You'll love the spacious interior and maintenance free living! Contact our team of Realtors in Louisville Ky for additional information about this property. 9012 Admont Ct Louisville KY 40220 is a terrific contemporary home with an open floor plan on a quiet street in Bryan Estates. You'll love the awesome location near shopping, dining, and movie theatres along Hurstbourne! An entry Foyer opens to a Sitting Room off of the Great Room. The Sitting Room would make the perfect space for an office, dining area, or playroom. The sunken Great Room is spacious and features a fireplace with raised stone hearth, built in book cases, vaulted ceiling, and two skylights! An open stairway connects the Great Room to a second floor loft space. The Eat In Kitchen has plenty of cabinet space, a nice dining area, and a pass through to the Great Room. The Kitchen is connected to a pretty tiled Sunroom (the perfect spot to enjoy your morning coffee, read a book, or entertain guests). There is a first floor Bedroom with a parquet wood floor. The current owners use the first floor bedroom as an additional Living Area. A Full Bath and Laundry are also positioned on the first floor. The Master Bedroom is sizeable with a vaulted ceiling. Two other spacious bedrooms and a Full Bath complete the second floor. 9012 Admont Ct Louisville KY 40220 has a fully fenced level back yard on a quiet cul-de-sac. The home also includes a pleasant back deck and two car attached garage. Give us a call today to set up your private showing and let us show you the joys of Louisville Real Estate! 124 Waterstone Way Louisville KY 40245 is a gorgeous home with extensive upgrades throughout, spacious interior, and ideal location on the edge of Beckley Creek Park! The landscaped yard and front porch entry open to a beautiful two story foyer with hardwood flooring that flows throughout the first floor. The two story Great Room showcases a fireplace with double mantle and built in book cases. The Formal Dining Room is accented by a columned entry, chandelier, wainscotting, and tray ceiling. The fabulous Eat-In Kitchen contains abundant cabinet space, granite counter tops, center island, under counter lighting, and a good sized dining area. The Kitchen opens to a Hearth Room with a cozy fireplace and built in book cases. The Master Suite is conveniently positioned on the first floor featuring a Sitting Room, fireplace, and tray ceiling. The luxurious Master Bath includes a walk in shower, jacuzzi tub, two vanity areas, and two walk-in closets! A half bath and Laundry complete the first floor. Stairs to the second floor lead to a loft with an additional sitting area. The second floor includes a full bath and three large bedrooms (two with built in book cases and one with a window seat). The crawl spaces in two of the bedrooms have been custom designed as play areas- a great way to store toys! A convenient laundry shoot connects the second floor to the first floor Laundry. The home has a huge basement and approximately half has been finished to include a Family Room, Den, Two additional Bedrooms, and a Full Bath. The basement has 9 1/2 foot ceilings and still contains a large unfinished space for storage or future expansion. This home will truly capture your heart! There is wiring for surround sound along with wall mounted volume controls in the Hearth Room, Master Bedroom, Great Room, and Patio area. 124 Waterstone Way Louisville KY 40245 also has a two car attached garage, sizeable wooded yard, and a gas line at the end of the patio for grill hookup. There is direct access to numerous amenities at Beckley Creek Park such as a community garden, trails, stocked fishing pond, picnic areas, dog park, playground, and splash park! You will love this home! Call today to set up your showing or for further information about homes in Waterstone! 191 Nevin Ln Fisherville KY 40023 is a beautiful four bedroom home positioned on over an acre of rolling land just across the county line. The home has been incredibly maintained and is the perfect spot to gather with family and friends. The full length front porch instantly welcomes guests into a wonderful two story foyer with hardwood flooring that continues throughout most of first level. The oversized Formal Dining Room is a fabulous entertaining space and opens to a Living Room with attractive fireplace. The hostess in your family will absolutely love the spacious kitchen showcasing custom vittitow cabinets, granite counters, recessed lighting, two stainless sinks, and black appliances. Lovely bay windows bring natural light into the kitchen dining area and provide a peaceful view of the property. The spacious first floor Master Suite includes a walk-in closet, tray ceiling, and Master Bath with dual vanity, jacuzzi tub, and shower. A half bath and Laundry are conveniently positioned on the first floor. Three other large bedrooms (each with its own walk-in closet) sit on the second floor along with another Full Bath. The walk out basement has been finished to include a Family Room with recreation area and fireplace as well a Full Bath. 191 Nevin Ln Fisherville KY 40023 offers garage parking for four vehicles boasting a two car attached & two car detached garage (added in 2004)! The back of the home includes a full length covered back deck and yard that instantly brings to mind barbeque parties and outdoor games. New dimensional shingles were installed in 2012 and the home has an expanded driveway as well as dual heating & air units. There is a school bus pick up as well as dry cleaning pick up! Call today to set up your private showing and for additional resources regarding homes in Spencer County & Louisville KY Real Estate.